Country lifestyle is our specialty! Not everyone wants to be in a subdivision on a small lot... and we cater to the folks who prefer a more rural setting for their home, horses or ranch. 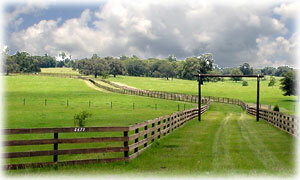 We deal in horse farms, cattle ranches and vacant land... from small to large acreage. We also deal in commercial land and unique properties! This is a Wonderful part of Florida...rolling hills, (yes hills!) beautiful views, and huge oak trees! We are in west central Florida boarded on the east by a large chain of lakes and the Withlacoochee River, on the west, by the Gulf of Mexico. We have state forest lands, a National Wildlife preserve and a 46 mile paved bike and riding trail. We still have quaint little country towns, good shopping, restaurants and dozens of golf courses. I-75 and the Florida Turnpike are close by and give easy access to Orlando, Tampa, Ocala and all parts of Florida. This is a place to raise a family, or enjoy your retirement, a place for country drives and going out your back door to watch the moon and stars and the sunrise or sunset. A place to have that little farm you always wanted, where you, your children or grandchildren can experience a quieter, more peaceful life. If you desire waterfront, Citrus County is traversed by seven rivers, several lakes, King's Bay and of course the Gulf of Mexico. So be it waterfront, riverfront, lakefront or bay front, you can take your pick in Citrus County. If your ready for a break from rushing traffic and the hectic pace of urban life... you will like it here. But, we are growing along with the rest of Florida, good land really is hard to find, and it is going fast. Let us help you find the right land for your home or business... we love our job and we'd love to meet you!